Kenneth Joseph "Ken" Howard, Jr. (March 28, 1944 – March 23, 2016) was an American actor. He was best known for his roles as Thomas Jefferson in 1776 and as basketball coach and former Chicago Bulls player Ken Reeves in the television show The White Shadow. He was elected president of the Screen Actors Guild in September 2009 and elected to a second term in September 2011. Howard died in Valencia, California on March 23, 2016 of pneumonia complicated by shingles and prostate cancer at the age of 71. ↑ Screen Actors Guild (24 September 2009). "Ken Howard Elected as Screen Actors Guild President; Amy Aquino Elected as Secretary-Treasurer". Press release. http://www.sag.org/press-releases/september-24-2009/ken-howard-elected-as-screen-actors-guild-presidentamy-aquino-elect. Retrieved 2011-12-07. ↑ Joshua L. Weinstein (22 September 2011). "Ken Howard Re-Elected President of SAG". The Wrap. Reuters. Retrieved 2011-12-07. 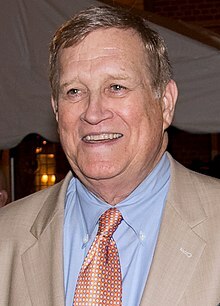 ↑ "Actor Ken Howard, TV Actor and Acting Union Leader, Dies". New York Times.com. Retrieved March 23, 2016. This page was last changed on 15 June 2018, at 05:00.